One of the best parts of confidence is having the audacity to wear whatever you want. No matter the season, I still look for super chic ways to express my style. In some cases it means super bright colors...and in other cases it means taking some un-expected pieces and making them work for a different season. I recently spent some time on the Express website, looking through their full range of dresses. I knew I wanted something chic, but not too bright...which is when I spotted this amazing dress. I know, it looks like something I should have saved for next summer...but remember what I said about wearing what you want? I had some hesitations with the sizing so I actually went into my local store to try it on before ordering it online. 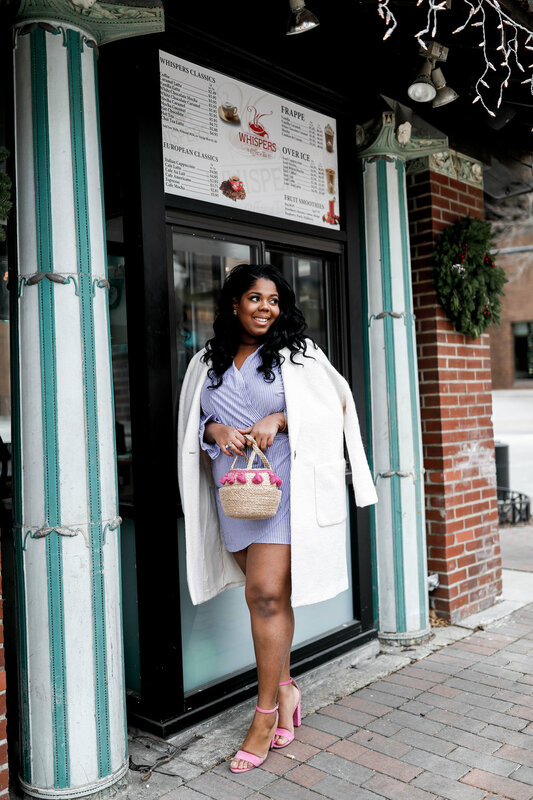 To help make it a bit more seasonal, I added this perfect oversized wool coat I found in white. Believe it or not, I actually do not own a white coat and this was a perfect compliment to the dress. The best part is that it is warm enough but still super cute. In true Hayet fashion, I needed a bit of character to the look, so I added in a bold Express bag. This bag is one of a kind and has a different take on the traditional basket totes. To tie the whole look together, I also threw in a bee ring that I found on their site. I will say I was pretty impressed with their collection of bold rings, and had options between this and even a large butterfly number. Have a look below and shop some of my favorite Express pieces at the end! This post was created in partnership with Express!